We, PT. Deltasindo Raya Sejahtera, are the Authorized Platinum Distributor and Qualified Service Partner (QSP) of Eaton Powerware series UPS in Indonesia. Our company is specializing in Power Protection Solution with more than 20 years experiences. 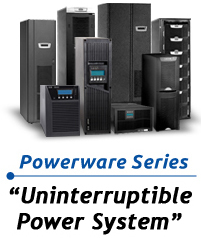 As the largest UPS specialized company in Indonesia, we provide the broadest full range of UPS & Parts ready-stock in Jakarta from 500VA to 1,100kVA, and our 24/7 technical support team - Eaton Powerware QSP certified - will always be there to support you. We constantly striving to improve our company performance. We are always focusing in giving our customers the best power solution to run their businesses - Powering Business with Care. We are fully aware and do care about the changing world that influences every sort of business and lives. We will always be there when you need power protection solution. In addition, we have earned and developed a superb reputation among our customers. Yet, we are still striving for 'continuous improvement' to serve a better world in front of us. We truly believed that our customers' success is our success because they are the ones who make us.